Warren Robinett must have drawn that shark. 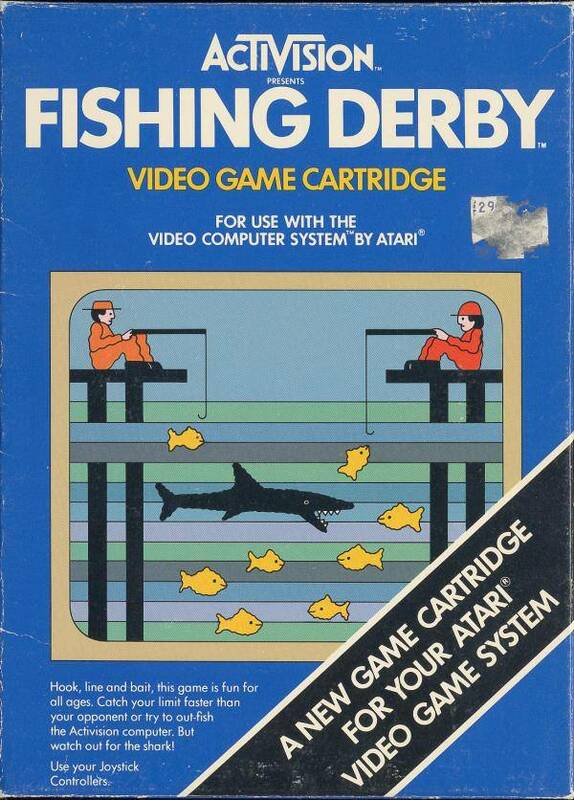 What could’ve been a laid back fishing trip to the piers is anything but in 1980’s Fishing Derby for the Atari 2600. In it, two opposing fisherman aim to out fish each other, which in this game means reaching ninety-nine points first. Fish are arranged in rows and are worth more points depending on how deep they reside. Getting a bite seemed hit and miss in my experiences with the game, but with a human opponent, this wasn’t as much of a detriment since both were facing the same problem. If one person was getting strikes consistently and the other wasn’t, it could be a tad funny, maybe. When a fish was on the line, managing it didn’t simply entail reeling it in as fast as possible thanks to the opportunistic shark roaming near the surface. A cute and easy to pick up and play game that, like Boxing, is at its best with a human opponent. In what seems like a still from The Red Green Show, two oafs try their luck at fishing in shark-infested waters. 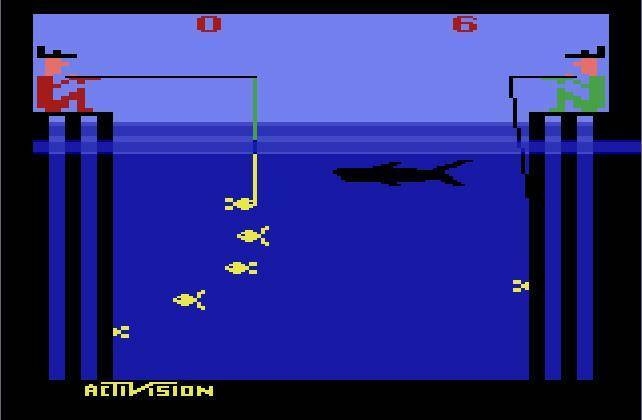 Fishing Derby was designed by David Crane who was arguably the most prolific designers of Atari 2600 games with titles like Dragster and Pitfall! to his name. He continued developing video games until the mid nineties and is perhaps most known post-Atari 2600 for A Boy and His Blob: Trouble on Blobolonia.